At Least 6 Killed As Party Boat Filled With Tourists Sinks In Colombia : The Two-Way At least six people are said to have died after the El Almirante ferry, which was carrying more than 150 passengers, began sinking. 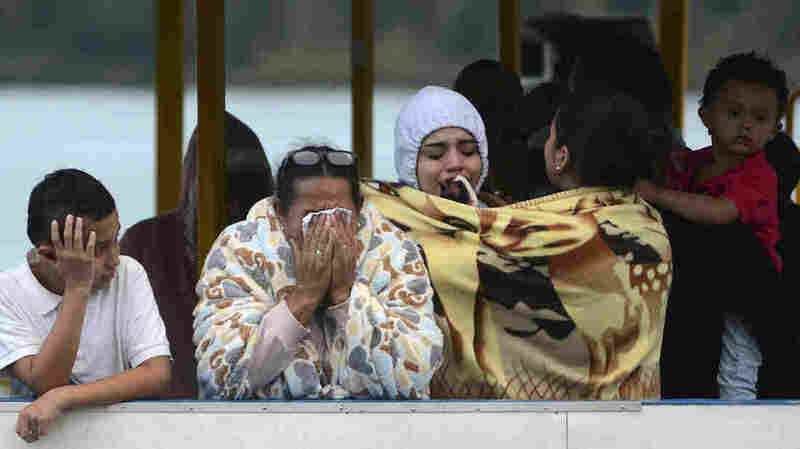 People who survived the capsizing of a ferry wait for more information about missing friends and relatives at a reservoir in Guatape, Colombia, on Sunday. It was a long holiday weekend in Colombia and the El Almirante ferry was filled with tourists. Soon after the boat began cruising around the reservoir in Guatape on Sunday, survivors described hearing a loud explosion near the men's bathroom that knocked out power, according to The Associated Press. Shortly after that, the boat carrying more than 150 passengers began sinking. The first two floors went underwater quickly as people rushed to get up to the fourth floor. At least six people were killed and more than a dozen others were missing, according to news reports, though the exact tolls varied. "Some people who witnessed the tragedy from the nearby shore said the boat appeared to be overloaded but Santos said it was sailing well below capacity. None of the passengers were wearing a life vest. Complicating the search, there wasn't even a passenger list. "Carlos Espinosa, an independent journalist from Guatape, said about a month ago townspeople awoke to find the El Almirante filled with water and sinking at its dock, suggesting that perhaps the vessel wasn't ready to return to the water."